Nintendo 3DS in-depth preview: it works! So, we got shuffled past a 3DS at a rapid pace this morning on our way out of the Nintendo keynote, but we've just had an opportunity to play some titles and really get a feel for the thing... and we're pretty impressed. Before we were only shown a technical demo, but at Nintendo's booth there are games, games, games. The booth was about evenly split between playable tech demos, non-playable live-rendered trailers, and regular 3D movies. Nintendo clearly is hard at work on titles for its system, and there's plenty of third party clout getting into the mix. Still, what impressed us more than the quantity was the quality. Most of the games are pretty easily on the level of iPhone 3GS graphics, and the 3D effect "just worked" on most all of them. Follow after the break for our full thoughts. Update: We've also got partial tech specs on the handheld -- find them after the break, too. 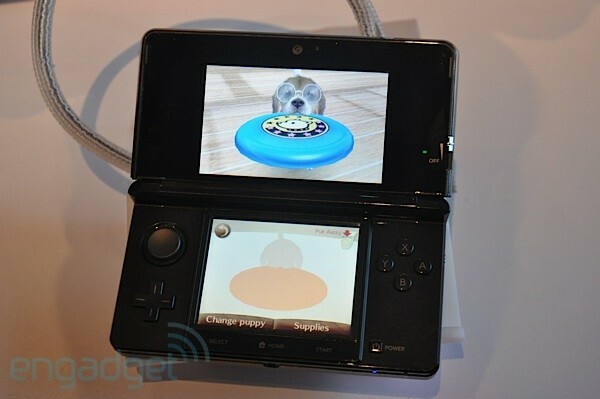 Update 2: We added a video of nintendogs + cats gameplay. It's very adorable, we assure you. The main thing with the system is that if you aren't looking straight on at the screen, you'll lose the 3D effect. There's a slight blip in image when you cross over that plane, but it's pretty easy to get back into the 3D range. We'd like to see what it's like on a bumpy subway ride, but the jostles of gaming aren't enough to knock us out too frequently. The screen itself is very high quality, and while it's just the slightest bit brighter and cleaner with 3D turned off (that 3D depth slider comes in handy for customizing the experience) it takes nowhere near the hit in brightness that you get with 3D glasses. Our one other qualm might be the tendency of blacks to get a bit metallic at slightly off angles. Oh, and a note on our shots of the device: Nintendo fought hard to keep us from taking direct pictures of the screen, because it doesn't photograph well at all, so if you're concerned about the screen due to some of the shots you've seen, don't be: it's fine, possibly even great. The bottom screen looks just like a slightly sharper DS screen, and we found ourselves not thrilled about flipping our eyes between the two screens when the top one had 3D on. Luckily, most of the gameplay didn't require more than our peripheral vision for the lower screen. There isn't so much to say about the physicality of the system outside of the analog nub. It's larger and moves further than the PSP equivalent, and it's a very welcome inclusion in the 3DS control scheme. Overall the hardware feels very solid and "premium," if just a bit chubby, though we're told what we're looking at right now is a developer preview that might not carry over 100% in fit, form and finish to the final unit. The three VGA cameras (one in the front, two in the back) all work about as well as you'd expect a VGA camera to perform, though we did appreciate the snappy shutter speed in the 3D photo-taking app. Similar to the Fujifilm Finepix Real 3D W1, you can operate a slider to set how far apart the dual images are, in order to find a spacing that your eyes are comfortable resolving. Unlike the Finepix Real 3D W1, you don't get sick looking at the screen. Our first go at the system was nintendogs + cats, and we were quickly won over by the adorable beagle we adopted. The frisbee seems to pop just slightly off the screen when it's held up by this furry friend, and you can almost feel the dog's paws resting up against the screen. Metal Gear Solid: Snake Eater 3D "The Naked Sample," meanwhile, was very impressive for a camera-control-only hands-on. A pitch-perfect replica of the first jungle level of Metal Gear Solid 3, the demo showed the handheld more than capable of PS2-quality graphics, with enough seamlessly integrated pop-out and depth effects (the foliage) to emulate a window into Snake's little world. Resident Evil Revelations had some of the best graphics we've ever seen on a mobile device, though they were only for close-cropped cutscenes of characters -- we doubt they can keep up this sort of fidelity throughout, and the title wasn't playable. Still, a modicum of camera control let us know what we were viewing was live-rendered, and it was impressive indeed. Kid Icarus wasn't playable, sadly, and graphics were a little blocky, but a brief video didn't completely fail to impress. Of all the 3D environments we saw for Nintendo's new handheld, Pit's rail shooter segments dizzily dodging laser beams showed the most stereoscopic depth. Space shooter StarFox 3D was one editor's favorite, and not just because it was actually playable -- like Metal Gear Solid, the demo brought the original game's first level to life convincingly, but also showed off quite satisfactory physical controls. We flew under arches in StarFox and through hoops in PilotWings with deft little motions of the analog slider, which we found both less touchy and more grippy than Sony's PSP nub. And oh yes, double-taps of the 3DS shoulder buttons had us performing loads of barrel rolls. Augmented reality: We love augmented reality in theory, and the addition of 3D and a bit of Nintendo-style insanity serves it well. We played one game where we strafed around an item card on the table, which blossomed a 3D monster bent on our destruction. Unfortunately, our intuition to lean around the object kept on taking us out of the 3DS's 3D sweet spot. Another game was much more effective, scanning our face with the front camera, and then pasting that face on flying robotic enemies that we could pan the 3DS around to aim at and attack. Steel Diver deserves a call-out for looking like a mildly polished game. You instruct a submarine to dive, surface and fire torpedoes while carefully managing its momentum through oceanic trenches and caves. The 3D effect was particularly notable because it made the experience feel real -- where the cut-away ocean feels lifeless in 2D, pushing the 3D slider north made it feel like we were looking into an aquarium. Samurai Warriors 3D was also playable, though it didn't have much depth -- the bland, monotone environment felt flat even in 3D mode, and the CG video segment jarringly alternated between close and far perspectives. Trailers for movies including Legend of the Guardians and Disney's Tangled showed we've come a long way since the days of sub-25fps MobiClip DS framerates -- both had plenty of stereoscopic effects and no visible artifacting, and were perfectly watchable in either 2D or 3D modes. Racing games are a shoe-in for 3D, and Ridge Racer was very comfortable to play, if not too particularly astonishing visually. Classics collection: Something we wouldn't expect, but a roundup of a few of Nintendo's classic titles (Super Mario Bros., Yoshi's Island were a couple we saw) is actually served pretty well by the 3DS, with those familiar pixelated backgrounds given just a bit of depth. It's unclear if, when or how this would hit market, but we sure hope it does. Notably we didn't see any titles using the accelerometer or gyroscope, but we anticipate good things once developers begin using them. Nintendo also isn't showing how 3DS might be backward compatible with existing DS titles, though it seems like it fairly trivial process to crop the screen or blow up pixels. Overall, we're pretty impressed with what Nintendo had to show, both in hardware and in software. Whether this will be enough to overcome the building threat of the iPhone remains to be seen, but it's a clear evolutionary step past the DS, and offers something in a handheld that will take years to really catch on with our big people consoles in the living room. Additional reporting by Sean Hollister. Top Screen: 3.53-inch widescreen LCD display, enabling 3D view without the need for special glasses; with 800x240 pixel resolution (400 pixels are allocated for each eye to enable 3D viewing). Wireless Communication: Can communicate in the 2.4 GHz band. Multiple Nintendo 3DS systems can connect via a local wireless connection to let users communicate or enjoy competitive game play. Systems also can connect to LAN access points to access the Internet and allow people to enjoy games with others. Will support IEEE 802.11 with enhanced security (WPA/WPA2). Nintendo 3DS hardware is designed so that even when not in use, it can automatically exchange data with other Nintendo 3DS systems or receive data via the Internet while in sleep mode. Game Controls: Touch screen, embedded microphone, A/B/X/Y face buttons, + Control Pad, L/R buttons, Start and Select buttons, "Slide Pad" that allows 360-degree analog input, one inner camera, two outer cameras, motion sensor and a gyro sensor. Input/Output: A port that accepts both Nintendo 3DS game cards and game cards for the Nintendo DS™ family of systems, an SD memory card slot, an AC adapter connector, a charging cradle terminal and a stereo headphone output jack.